THIS BOOK HAS WON PRESTIGIOUS AWARDS! Raine's books are on display on the central pillar in the store Paper Plus Manly, my thanks to the manager for displaying my books. Raine demonstrates her spiritual growth and her acknowledgement of psychic gifts despite her initial self denial. Raine encourages the reader to open their minds to inter-dimensional learning and offers the readers self empowerment. "And Rainedrops Fall Down My Cheeks" is ​ an extraordinary account of the experiences of a woman with the second sight . Her story reveals a world invisible to the rest of us, which I have yet to see documented with such openness and honesty. Her sincerity toward her reader as she describes her growing understanding of her gift through trials, tribulations, insights and revelations shines through, as does the transcendental love that she radiates to those around her, and through her book . H er experiences, and those of people like her, deserve serious consideration, since they are part of the of the reality in which we all live. No world view that excludes them can be considered complete. 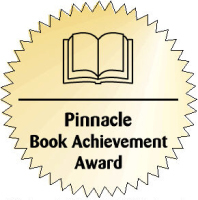 - Ila France Porcher, Author of the "Shark Sessions"
Congratulations Raine ​on a most interesting and well written book. The presentation is excellent , the content got my attention and left me wantinng more. The author's experiences were written so clearly that the reader can easiy distingush these happenings as very real and not part of the author's imagination. I would go so far as to state that even the skeptc would be abe to read this book and be supportive of the author. Raine I believe you were inspired as you wrote this book and received spiritual guidance helping you to choose amongst your many exxperiences, which ones to share with your readers. I look forward to reading your next book. This was an interesting and thoughtul read. Spiritually and religious beiefs intertwined in a heartwarming journe y into the heart and mind of a woman of faith. This was different from the books I normally read, and I'm pleased I was given the opportunity to read ​Raine's ​ story. Very easy to read with short chapters. The author shares titbits/stories about her life as a medium and the experiences she had accepting her gift(s) and allowing them to touch others lives and hers. Well written, insightful and enlightening. I was so touched by her powerful book on her trip to India , that I recommend reading that as well, but in order that she has written her three books. Thanks for your honesty aand sharing your gift with us. 'I am neither a medium, spiritualist, or anything of the like. I'd go so far as to call myself a skeptic , having never experienced or known anyone with direct experience of any of the phenominal you apparently encounter on a daily basis. That said, I found your book both enlightening and inspiring and I'm sure other people wlil too." This book gives a glimpse into the life of a psychic with stories that warm your heart and feed your sou l. Raine maps her spiritual path while showing the unavoidable adversity and tragedies of being human. I look forward to her next book! I thought the book was very good. It had a great insight to Raine's abilities i.e. how she connects to the animals, talks to the animals. I think that is so coo l. I think it's great that Raine had such an early start in her life to be able to "see" people from the other side. Once you have read it, it's really important to go back and read it again because you absorb more the second time around. It had it's spooky moments! A definite "must" read ! I can relate to the story; I think it is so important to open your awareness to inter-dimensional energie s. I think, the author must have made a difference to many through this book. - Taran Dhillon author of "Nectar of the Grateful Victim"
Raine is quite an incredible woman. Imagine being on speaking terms with your guardian ange l. Imagine being able to see dead people and give comfort to the rest of us who don't have these gifts. I've read a lot of books about mediums who can communicate with the dead , but this is the first book where I was able to read the story of a very human woman who has become a medium. Hearing her life story and the influences in her life that made her the remarkable woman she is today was so amazing. Raine's dreams were like being allowed a view into a greater world than the one we live in . That fact that she can keep her feet on the ground while communing with the spirit world says a lot about who she is. Raine might just be one of the most interesting people I've ever had the pleasure of reading about . I hope she keeps up her sacred work and that she writes more books. In these dark times, it's reassuring to know we have people like Raine keeping the light going for us all. - Robin Landry author of "When I Dream"
This hard covered book was an easy read good size to handle. Chapter by chapter it was hard to put down so I was excited to find out what else did Raine (the author's) discover on her journeys. I will re-read it again but instead of running through each chapter sit and embrace each journey/experience this time. I do think this book should have come with a purse pack of tissues as rainedrops also fell down my cheeks. Not because of the authors sadness but a joyous warmth of her experiences. What an absolutely lovely book. It is very heartwarming a joy to read. Raine's message is self-empowermen t and spiritual development . I also have felt these spirits very strongly. They are trying to tell me something and to warn me. I ignored them once but never again. Their warning was the imminent death of a dearly loved one. I think most readers will identify with this charming and beautiful book. I especially liked her experiences with her animals because I think most of us have loved a pet . Raine says that we all are needed and we all are loved on this beautiful Earth. Amen! A fine job, Raine ! Now all of you readers, buy this book! The Moon" and "The Biggest Explosions In The Universe"
This is a fabulous book from a first time writer who takes you on her adventures into the spiritual world from her early childhood to the present time. A story that is full of warmth and laughter and definitely a few tear s. This book should be read with an open mind as she take's you on her many journeys with her friends. Looking forward to the next book. This was a wonderful book and I found it very hard to put down. With your guardian angel along to help one grow, its amazing the experiences one can learn from. There are many messages found in this boo k, and they start to unfold as you relate to experiences in your own life. It was a wonderful insight into how the spirit world works. Read it - you may need some tissues as it can be very emotional. This is an enthralling story that takes you by the hand through all her spiritual adventures through life. It is a book that you will have trouble putting down once you start reading. Can not wait to read her next book . Loved the colour of this book and the hard cover was easy to hold and the print great for reading (for those like me who have bad hands and eyesight.) What a life Raine (the author) has been having and I found each chapter of her journey extremely interesting. This author ( Raine ) is a survivor and needs to still be on this side of the world. She gives so much love and hope to us all. An inspirational story of Raine's journey of discovery and acceptance of her psychic gifts: In this relatively brief book Raine identifies what she sees, in hindsight, as key experiences and learnings in her life's journey contributing to her gradual discovery and acceptance of her psychic gifts. It is a story of her determination to overcome adver sity, especially serious illness and injury; her love and loyalty to family and friends; and her willingness to share deeply personal experiences and learnings. I t is a most interesting account and easily read - and needs to be reread, as I discovered on a second reading some of the jewels of insight and wisdom I had missed. " And Rainedrops Fall Down my Cheeks " will encourage those facing adversity , and assist those wishing to 'make sense' of near death experiences , significant dreams, or maybe paranormal encounters. It is also an inspiration to those who, like me, have a growing awareness of communication with the spirit world, and would also be enjoyed by those readers who just enjoy an interesting autobiography. Great read, inspirtational: This was a great read. Very hard to put down. It's amazing what one person can go through and with the help of their guardian angel can learn and grow so much. Many messages to be found in this amazing book, when reading it you don't realise that they are there until things happen in your life. I found this after reading Raine's book, it gives you more undersanding of how the spirit world works when you don't even realise it. A supersensitive, precocious and psychically gifted child , Raine , the author of the fascinating, moving and spellbinding memoir - " And Rainedrops Fall Down My Cheeks" - recounts in this slim volume of 28 short chapters her psychic and spiritual journey from small child to advanced adulthood., Her initial mysterious night time encounters at a very yo ung age wit h Alor , her guardian angel and benign presence, are both scary and comforting. But Alor remains a benign, accessible and trustworthy presence throughout Raine's lif e, although she does not always know how to get his attention and assistance until she gets older and wiser. As she matures, her spiritual and psychic gifts allow her also to commune a nd have most treasured and meaningful relationships with animal s - cats and dogs mainly. But she is also sensitive to communicative behaviours of wild animals, specifically birds, whose warnings Raine perceives and heeds. All her life, Raine lives in a world surrounded by spirits whose mystery she finds herself unable to reveal to friends and loved ones. In a life-threatening car accident, Raine goes through a near death experience. She welcomes the experience of passing over, but by sheer willpower she pulls back into life out of compassion for her injured fellow passengers. Long expected to be a true psychic by her friends, who seem to know her better than she does, Raine herself is slow in accepting the extraordinary gift she posses. She eventually overcomes her timidity when she takes courage to make beneficial use of her psychic gift. As she starts formal readings, she experiences that " from somewhere information just flows in." Step by step, over her lifetime, Raine moves steadily forwards on her spiritual journey; and, by example, she encourages the readers of her poignant memoir to set out and advance on their own spiritual journeys. In this very absorbing memoir, " And Rainedrops Fall Down My Cheeks ", Raine takes her readers on a most remarkable, moving and esoteric journey. Raine has the ability to make you feel your grief and receive comfort at the same time . The touching stories she recounts bring peace to your own life and situation. I appreciate the message of love and acceptance, that we as individuals need to strive to see ourselves positively, and practice thankfulness for all things, no matter how small it may seem . This is a book I have reread and will return to again . Raine talks to the reader directly bringing them into her life's journey. This authors kind, loving, genuine ways inspire and will positively influence the most critical of skeptics. At times she berates her inability to help others. Yet it is the development of her "knowing" which came through physical and emotional pain that makes her indeed able to help. Reading Raine’s personal story of guardian angels and contact with the spiritual world was truly amazing. Her touching words literally brought tears to my own eyes. Her soul searching journey is filled with love and compassion and will keep you turning the pages until you reach the end. Then you will want MORE ! Her outstanding writing and visual description pulls you deep into the stor y. Beautiful beyond belief. I look forward to reading her next book. A fabulous author who writes with warmth and love.
" I often wondered about the world that exists just beyond the purview of our mundane day-to-day existence." And Rainedrops Fall Down My Cheeks" took me on a mystical journey with Raine as she discovers a parallel universe that reveals her own psychic gift s to her. Her intimate sharing of her sometimes traumatic life experiences and how messages of her special abilities are channeled to her in her experiences with her friends and family provides a fascinating insight to our own higher consciousness that we are often ignorant of. I was given your book by my mother who met you in New Zealand a few months ago. I found your book to be very inspirational. I also reflects a lot of what I feel daily inside of m yself, Thank you for the beautiful scripture you wrote inside the front cover for me. I wanted to share this with you. This was such a compelling book I couldn't put it down . I'm so grateful to the author for being open and honest by sharing her story. When Raine described her pain and suffering she was going through I could relate it to some experiences I went through in my life, and now I have a deeper understanding of why the type of things happen to us. T his was such a compelling book to read. I highly recommend this book!! ! I am at a loss here. I am open to the universe and all that is part of it. But I am totally not spiritual and really don't know how to describe this book. I find it amazing how Raine managed to cope with all her sicknesses and accidents, obviously with the help of her Guardian Angel. Her dreams and supernatural experiences will appeal to readers who are inclined in a similar way. T his book should be an encouragement to people who are sensitive to such perception and give insight into Raine's early life . Slowly, Raine , the author of that fantastic book, is growing and getting the understanding of her amazing gift, God and his Angels gave her . And so she can start using it in a wonderful and effective way and helping people to understand their loss and grief. I, for myself, had once an experience and I still dwell on it after years. I felt the love of Jesus. It was fantastic and I know HE is with me as well, as Raine describes all of her experiences. I recommend this book for everyone to read. - Gigi Sedlmayer, Author of he "Talon Series"
I had the pleasure of meeting the author at one of her book signings in Brisbane and I was delighted to find that she is a lovely person considering some of the trials and tribulations she has had in her life. It made me realize that 'having a gift' can be a curse and a blessing . Raine's book is a testament to anyone who does not 'believe' in certain things in life, be it spiritual or religious. It is an honest book which makes even the unbelievers realize that there are people who can see what we cannot. This is a small book but it is packed with stories which will delight and may even scare readers but it is a book which deserves to be read. For a first time author, Raine , has certainly brought all her experiences to life. One can only admire the courage that is needed to expose one's physical and spiritual journey through life in this manner . One needs to keep an open mind when reading this book, it is certainly not for those of fixed ideas or opinions on the issues of premonitions, second sight or an after-life. The book holds the attention wel l, it is easy to read and, in this format, easy to handle. I can certainly commend it to anyone with an interest in matters spiritual or who may be seeking inspiration from someone who has certainly exhibited determination, courage and resilience . - Patrick G Cox author of "The Enemy Is Within!" Dearest Raine, I congratulate and admire your ability to awaken peoples awareness to the natural signs of life , also in your belief to share your clear insight for the benefit of others. As Raine has looked back through the corridors of her past with its trials and uplifts, she has been moved upon to put pen to paper, with the desire that maybe she, Raine , might be instrumental in inspiring another to share memories of feelings and understandings from childhood days. Sharing with the reader moments of spirit encounters and commuications can in itself broaden one's outlook. Through sharing, Raine reaches out to others, and in doing so can free their soul. 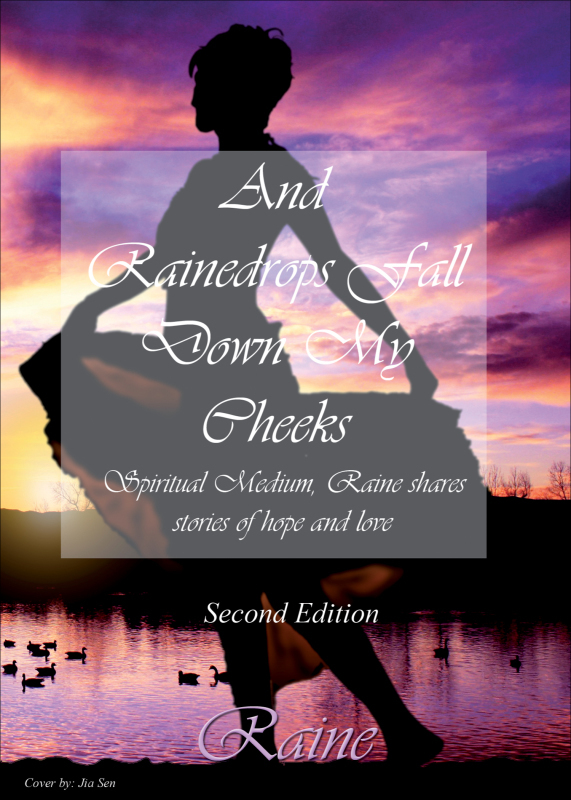 An Amazing Metaphysical Journey - Raine's book, " And Rainedrops Fall Down My Cheeks ," is truly a fascinating book about a woman's journey through the physical and metaphysical worlds. As a student of a different kind of metaphysics, I appreciate the details of the life experiences that led her to discover her "gifts;" but more importantly, I appreciate the way she tells her life's story. I have always appreciated authors who speak conversationally through their books. Their sincerity, passion and gratitude shine from every paragraph - every page. Raine's writing style helps the reader to actually "see" what she was seeing as she wrote her story , creating a closer connection with the reader and helping the reader fully appreciate the wonder of Raine's experiences. Raine takes the reader with her on her journey through her awakening through her gifts, as well as her journey of overcoming the fear and self-doubts her gifts caused her initially. - William Speir author of "Knights of the Saltier - Book One of the Order of the Saltier Trilogy"
​ The book has a wonderful presentation and was very easy to read. It was most relaxing reading from one chapter to the next and is a great family orientated book which can be hard to come by today! Be prepared, this is a very emotional book to read, it was just wonderful and very inspirational. Well done Raine. A deeply moving, deeply personal journey in which Love triumphs again and again over fear, grief, resentment, and profound pain, leaving tears of gratitude in their place . Raine's life gives hope to those who are hurting - you are not alone, whether or not you can feel the love which surrounds you. She gives hope to those facing death - life never ends. She gives courage to those who feel they cannot get through a difficult circumstance or emotion, as well as to those who experience things that others don't. It can be okay, wisdom opens doors and guides us through. Watch Raine keep opening her heart to the next moment. A sterling example to follow. I am waiting for her next book of spiritual teachings!!! I have known Raine for many years and travelled through some parts of her adventure with her. She is a brave and courageous lady to have written so honestly about her experiences - it has not been the easiest of roads to travel . It is through books such as this that others may come to an understanding of their gifts and abilities, to be able to accept them and use them for the highest good of all through a genuine concern for others. To be able to step through the fears and prejudice that these experiences can trigger initially - sometimes it is our own fears, sometimes it is the fears of those around us, all through the lack of understanding of what is going on - that is the wonderful gift that a book such as this can bring to us all. Acceptance and understanding. "And Rainedrops Fall Down My Cheeks" tells of the author's many different life experiences in which she estabish a justification of the reason for them is much more than being human and we have guardian angels. The author mentioned several experiences during her life that were devastating, such as the death of her grandmothers, her Dad and a family cat. Also a very seriious car accident was the highlight of her reflection into the medium. She believed she had the power to sense things from other people and guide them through communications of the spirits. The author states "I carry a deep belief from those times of near death experiences there is someone who await for each of us with an abiding love that is greater than any love experienced here on this earth"
In my understanding of the author she has a very strong beief in the paranormal. I connected to Raine's idea of having the sense of being watched and having the sense of a voice saying be watchful and listen to everything as well as communications through animals. Warning! Before reading this book, grab a box of tissues. This book was wel written and entertaining. Being an animal lover the section that dealt with animals were my favorite. This book grabbed my attention from the beginning. The topic is fascinating.The author shares her experiences with readers and encourges them to develop their gifts. Fascinating! This book is thought provoking and well written. I would highly recommend this book! EVERY NOW AND THEN . . . BEAUTIFUL ANGELS APPEAR . . . CLEVERLY DISGUISED . . . AS ORDINARY HUMAN BEINGS!